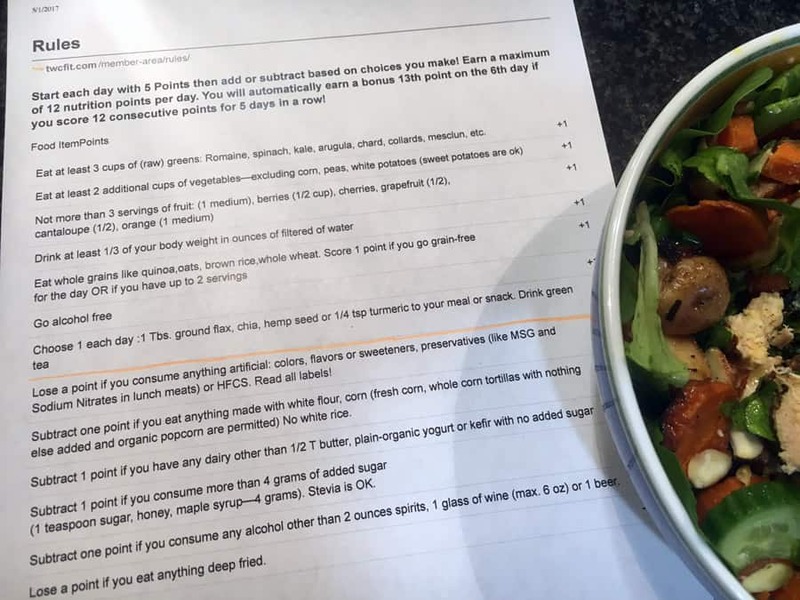 I have done the TWC enough times that I pretty much know by heart what to eat and avoid eating to get 12 nutrition points. Nevertheless, it helps to have a reminder so I printed the rules from the website. This is especially helpful to remind me to drink enough water – I think I fall short of drinking enough water when I am not doing the Challenge. I joined my running group at 6am for our normal 6 mile loop. I felt tired and looked forward to the walk breaks. I got consumed by emails and computer work after pouring my coffee, and was mad at myself for succumbing to my bad habit of getting on the computer before I shower , walk the dog and eat breakfast. I did get a few small tasks out of the way, however, which felt good. I made some oatmeal with apples, chia seeds and cinnamon again. I love having my grain serving in the morning! Because I was multi-tasking much of the morning and into the afternoon, I realized this habit causes me to often – almost always – skip a “real” lunch. My go-to lunch is a bunch of tortilla chips, sometimes with a green smoothie. Today, I remembered I had some salad leftover from Chopp’t yesterday and there was a couple of forkfuls of a chicken salad in the fridge that I had made over the weekend with yogurt and hummus. The two things combined did not fill me up (and the day-old salad was not very good), but there wasn’t much to be done about it. I dipped some snow peas in leftover guacamole and headed out the door for a meeting. There were some nuts and sliced peppers at the meeting, so I snacked very minimally. When I got home, I grabbed an apple before heading off to another appointment. I was pretty hungry! I kept filling my water bottle, which helped a little bit. Dinner was leftovers. I had grilled some chicken and vegetables over the weekend and so placed that on top of my garden lettuce. I added some sliced baby cucumbers and sliced green onion and almonds. 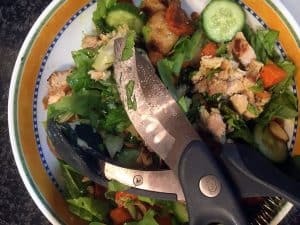 After I put the salad together, I took a pair of kitchen scissors and chopped up the salad. I find this makes it easier to eat and somehow seems more filling to me. I really wanted some crackers or chips with it, but filled a small bowl with grapes, blackberries and clementine slices instead. 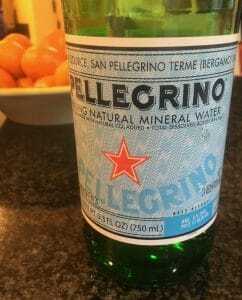 I had some San Pelegrino water with dinner as a “treat,” where I might usually have wine. As soon as I publish this post, I am going to stretch. I already recored my scores for the day and gave myself the point, so need to be honest and earn it!